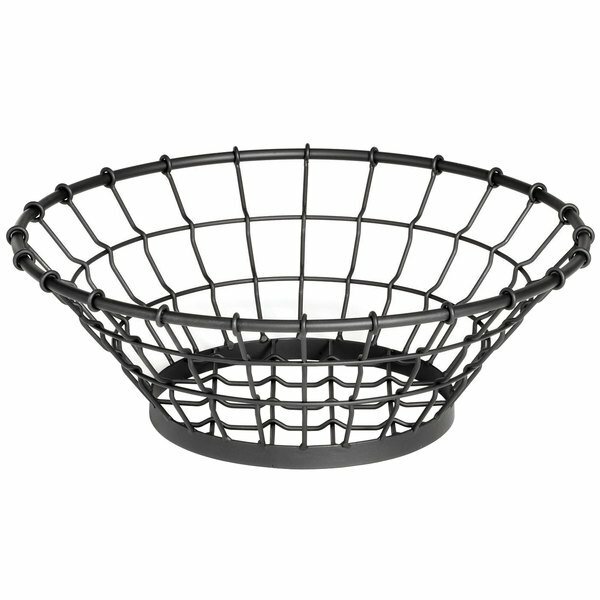 Tablecraft GM15 Grand Master Round Black Wire Basket - 15" x 5 1/4"
From the Grand Master collection, the Tablecraft GM15 round black wire basket is powder coated for a durable finish and sleek design. From the buffet to the tabletop, this modern metal wire basket provides trendy versatility for any application. The Tablecraft GM15 basket allows you to use your imagination. You can use this basket to serve bread, bagels, pastries, or showcase napkins, decorative soaps and towels. Clipper Mill by GET WB-104C Chrome Plated Iron Square Wire Basket - 12" x 12" x 2"
American Metalcraft BZZ59C Chrome Zorro Rectangular Basket - 9" x 6" x 2 1/2"
Cal-Mil 4114-10-13 Portland Large Black Wire Basket - 10 1/2" x 5 1/2"